3.01 (1.09) The Ball The ball shall be a sphere formed by yarn wound around a small core of cork, rubber or similar material, covered with two strips of white horsehide or cowhide, tightly stitched together. It shall weigh not less than five nor more than 51⁄4 ounces avoirdupois and measure not less than nine nor more than 91⁄4 inches in circumference. 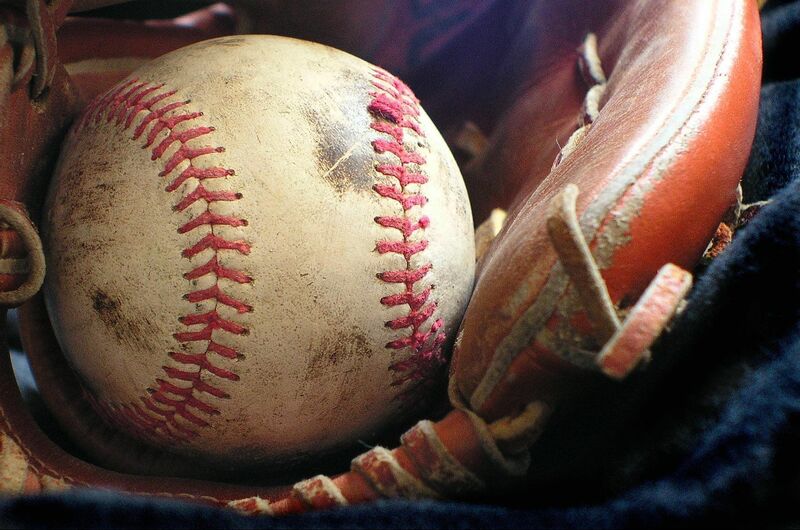 (3.02) No player shall intentionally discolor or damage the ball by rubbing it with soil, rosin, paraffin, licorice, sand-paper, emery- paper or other foreign substance. PENALTY: The umpire shall demand the ball and remove the offender from the game. In addition, the offender shall be suspended automatically for 10 games. For rules in regard to a pitcher defacing the ball, see Rules 6.02(c)(2) through (6) (Rules 8.02(a)(2) through (6)).
. Rule 3.01 Comment (Rule 5.02 Comment): Should a ball come partially apart in a game, it is in play until the play is completed.
. (a) The bat shall be a smooth, round stick not more than 2.61 inches in diameter at the thickest part and not more than 42 inches in length. The bat shall be one piece of solid wood. NOTE: No laminated or experimental bats shall be used in a professional game (either championship season or exhibition games) until the manufacturer has secured approval from the Rules Committee of his design and methods of manufacture.
. (b) Cupped Bats. An indentation in the end of the bat up to 11⁄4 inches in depth is permitted and may be no wider than two inches and no less than one inch in diameter. The indentation must be curved with no foreign substance added.
. (c) The bat handle, for not more than18inches from its end, maybe covered or treated with any material or substance to improve the grip. Any such material or substance that extends past the 18- inch limitation shall cause the bat to be removed from the game. NOTE: If the umpire discovers that the bat does not con- form to (c) above until a time during or after which the bat has been used in play, it shall not be grounds for declaring the batter out, or ejected from the game. Rule 3.02(c) Comment (Rule 1.10(c) Comment): If pine tar extends past the 18-inch limitation, then the umpire, on his own initiative or if alerted by the opposing team, shall order the batter to use a different bat. The batter may use the bat later in the game only if the excess substance is removed. If no objections are raised prior to a bat’s use, then a violation of Rule 3.02(c) (Rule 1.10(c)) on that play does not nullify any action or play on the field and no protests of such play shall be allowed. (d) No colored bat may be used in a professional game unless approved by the Rules Committee. “ART. 2 . . . The bat shall have the following characteristics and components. 2. Not have exposed rivets, pins, rough or sharp edges or any form of exterior fastener that would present a hazard. 3. Be free of rattles, dents, burrs, cracks and sharp edges. Bats that are broken, altered or that deface the ball are illegal. Materials inside the bat or treatments/devices used to alter the bat specifications and/or enhance performance are prohibited and render the bat illegal. 1. Knob. The bat knob shall protrude from the handle. The knob may be molded, lathed, welded or permanently fastened. Devices, attachments or wrappings are permitted except those that cause the knob to become flush with the handle. A one-piece rubber knob and bat grip combination is illegal. 2. Handle. The bat handle is the area of the bat that begins at, but does not include, the knob and ends where the taper begins. “3. Barrel. The barrel is the area intended for contact with the pitch. The barrel shall be round, cylindrically symmetric, with a smooth contour. The barrel may be aluminum, wood or composite (made of two or more materials). The type of bat (wood, aluminum or composite) shall be determined by the composition of the barrel. “4. Taper. The taper is an optional transition area which connects the narrower handle to the wider barrel portion of the bat. Its length and material may vary but may not extend more than 18 inches from the base of the knob. 5. End Cap. The end cap is made of rubber, vinyl, plastic or other approved material. It shall be firmly secured and permanently affixed to the end of the bat so that it cannot be removed by anyone other than the manufacturer, without damaging or destroying it. By definition, a one-piece construction bat does not have an end cap. 1. Have a safety grip made of cork, tape (no smooth, plastic tape) or commercially manufactured composition material. The grip must extend a minimum of 10 inches, but not more than 18 inches, from the base of the knob. Slippery tape or similar material shall be prohibited. Resin, pine tar or any drying agent to enhance the hold are permitted only on the grip. Molded grips are illegal. “2. Be 2 5/8” or less in diameter at thickest part and 36 inches or less in length. 3. Not weigh, numerically, more than three ounces less than the length of the bat (e.g., a 33-inch-long bat cannot be less than 30 ounces). NOTE: The NFHS has been advised that certain manufacturers consider alteration, modification and "doctoring" of their bats to be unlawful and subject to civil and, under certain circumstances, criminal action. “ART. 4 . . . Only bats may be used in warming up (including weighted bats used for this purpose) at any location. Only bats and items designed to remain part of the bat, such as weighted bats, batting donuts, and wind-resistant devices are legal at any location. ART. 5 . . . Bats that are altered from the manufacturer’s original design and production, or that do not meet the rule specifications, are illegal (See 7-4-1a). No artificial or intentional means shall be used to control the temperature of the bat. No foreign substance may be inserted into the bat. Bats that are broken, cracked or dented or that deface the ball, i.e., tear the ball, shall be removed without penalty. A bat that continually discolors the ball may be removed from the game with no penalty at the “ART. 5 . . . Bats that are altered from the manufacturer’s original design and production, or that do not meet the rule specifications, are illegal (See 7-4-1a). No artificial or intentional means shall be used to control the temperature of the bat. No foreign substance may be inserted into the bat. Bats that are broken, cracked or dented or that deface the ball, i.e., tear the ball, shall be removed without penalty. A bat that continually discolors the ball may be removed from the game with no penalty at the discretion of the umpire.